Stir in all the sauce ingredients in a medium bowl to blend. Cover and chill in refrigerator. Line a large baking sheet with plastic wrap for placing uncooked meatballs. Mix ground lamb with mint, grated onions, garlic, paprika, cumin, salt and cayenne pepper in a large bowl until well-combined. 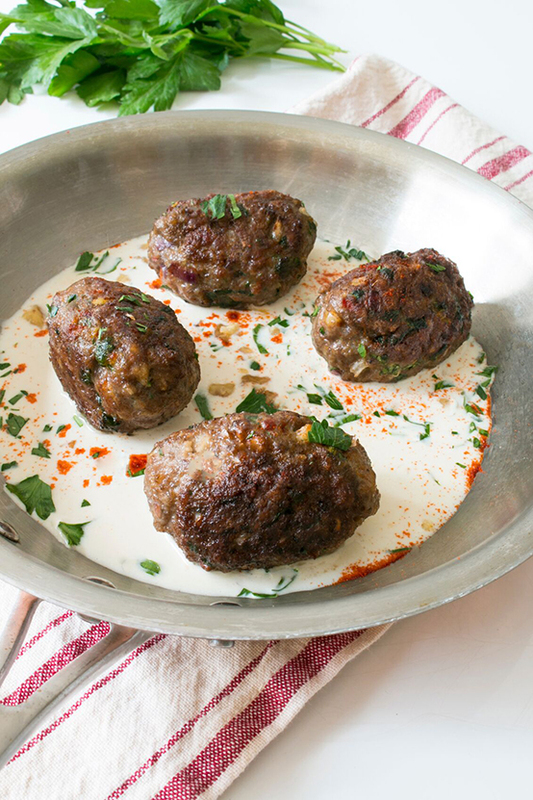 Using your hands, measure approximately 2 tablespoons for each meatball. Place on lined baking sheet. Set aside. Heat a large skillet over medium-high heat. Add flatbreads to hot skillet one at a timeand cook until lightly browned on each side, approximately 2 minutes per side. Enclose in a large sheet of aluminum foil, wrap closed and place in oven to keep warm. Add 1 tablespoon oil to the same hot skillet over medium-high heat. Add onion slices and season with salt and pepper to taste. Sauté until golden brown, approximately 6-8 minutes. Transfer onions t one side of a large rimmed baking sheet and place in oven to stay warm. Add 1 more tablespoon of oil to the same hot skillet. Sauté half of the meatballs until just cooked through, approximately 6-8 minutes. Transfer to the baking sheet in the oven to keep warm. Repeat process with remaining uncooked meatballs. Arrange onions and meatballs on a large serving platter. Serve with warm flatbreads and chilled yogurt sauce. Serves 4-6.